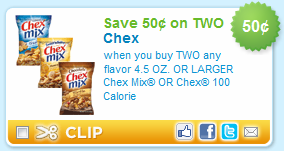 Print Chex Mix Coupon For Next Week At Rite Aid! February 12, 2011 · by Zack & Katie · Post may contain affiliate links. See my disclosure policy here. If you don't have any coupons from the 1/2 or 1/30 Smart Source, you can print $0.50/2 Chex Mix coupons here. This coupon will make them $0.25 each at Rite Aid from 2/13-2/19 after +Ups and the coupon! Use Zip 90210 if you can't find them with yours.